Minister of Foreign Affairs, Nabil Fahmy, has stated that Egypt refutes military intervention in Syria, insisting that the only way is a political solution in the war-torn country. "Egypt rejects military intervention in Syria, as we believe a political solution is the only way out for the crisis there. Egypt supports the Geneva Two talks," said FM Fahmy in a press conference held at the Ministry of Foreign Affairs in Cairo Tuesday. "Egypt condemns the use of chemical weapons, not only in Syria. We strongly refute it regardless of whoever uses such weapons against civilians," said the FM, who added that Egypt is waiting for the results of UN investigations concerning Ghouta's chemical weapons attack. "Accountability should be based on accurate information, in order to determine who is responsible for the chemical attack in Ghouta," said Fahmy. He also stated that Egypt does not support 'Jihadists' in Syria. Tensions have ratcheted up dramatically in recent days as Washington has warned Syria's regime it will face action over alleged chemical weapons strikes in Damascus in which hundreds are said to have been killed. 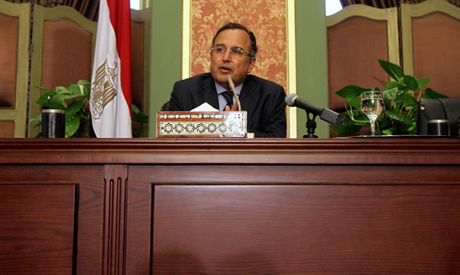 In the same conference, the Minister of Foreign Affairs expressed Egypt's total refusal of the internationalisation of Egyptian internal affairs, describing this as "unacceptable." Fahmy also added that Egypt is in the process of revising all foreign aids it receives. "This will be a periodical consideration in Egypt," he added. "Egypt refutes the statements of the Turkish PM against the Grand Imam of Al-Azhar," said the Foreign Minister, who added that Egypt has rejected Turkey's request to increase members of its diplomatic commission in Egypt. "Nevertheless, we do not have any problem with the Turkish people and we hope that, in the long run, our relations with Turkey will be good," he added. Erdogan made a speech at the University Development Foundation on Sunday in Rize province, where he reportedly condemned what he described as a "military coup" in Egypt, stating that he was "disappointed" to see the Grand Imam of Al-Azhar, Ahmed Al-Tayeb, side with the "coup" leaders. Regarding negotiations with Ethiopia concerning the Renaissance Dam, FM Fahmy revealed that there was a scheduled meeting between the ministers of irrigation in Egypt, Ethiopia and Sudan in Khartoum this week, but it has been delayed due to floods in Sudan. "Nevertheless talks are ongoing with Ethiopian and Sudanese officials. I am supposed to meet with the Ethiopian FM in New York after the UN General Assembly next month," said Fahmy. Ethiopia set off alarm bells in Cairo last almost three months ago when it began diverting a stretch of the Blue Nile to make way for the $4.7 billion hydroelectric plant. The Blue Nile is one of the Nile River’s two major tributaries, and thus the Ethiopian project has prompted fears that Egypt’s share of potable water could be reduced. The Nile riparian countries have argued over the use of the Niles' waters for decades – and analysts have repeatedly warned that these disputes could boil over into war. Diplomacy & political solutions should always be the first choice of any "reasonable" nation. Anyone that has been keeping a close eye on the Syria situation would already know that these measures have been exhausted over & over again. No one wants to get pulled into a war, but who honestly could sit back & watch any longer hundreds of thousands of innocent men,women & children being murdered in this country & the international community just allows it to happen?? Should we just say "it's not my problem let them die?" or should we make an effort to stop a man that obviously does not care about his countrymen? I tell you what's appalling, that no one in the region seems to give a crap about their fellow mankind! The only ones with any compassion & backbone are the U.S., Turkey and France! The rest of the world should be ashamed! If you do nothing & don't voice your disgust of this regime, then those innocent people's blood is on your hands! So why we didn't follow the political path in Egypt? The world has tried to solve the situation in Syria by political means and it failed, how many more Syrians have to die and be displaced, before a military intervention. Many countries our now hosting over a million refugees, most countries significantly more than Egypt perhaps Nabil Fahmy can politically solve this crisis before the next gas attack and, in the meantime host and/or support the millions of refugees! If the political solution failed in syria, it is ALSO because the opposition is not able to show the face of a (unified) democratic one. Both Syrian and Egyptian governments has committed severe crimes against their people.